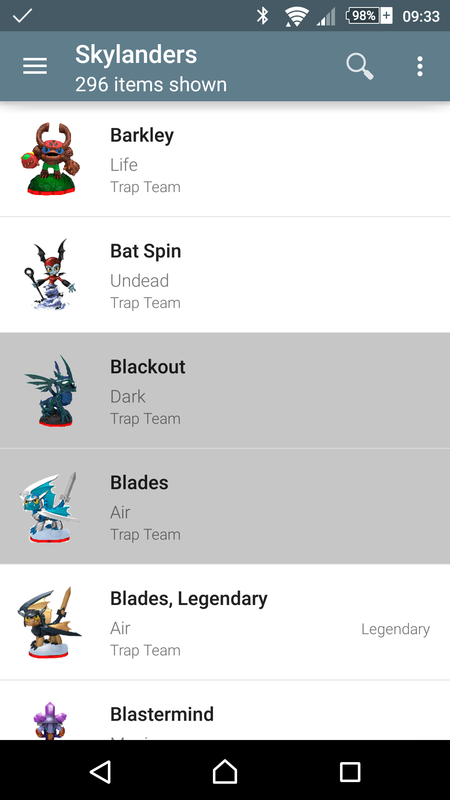 My Board Game Collection is our newest app that allows you to keep track of what board games (table top games, card games, family games, …) you own, want, have played, … and more. It does this on all platforms with the same feature set and with a good looking UI. 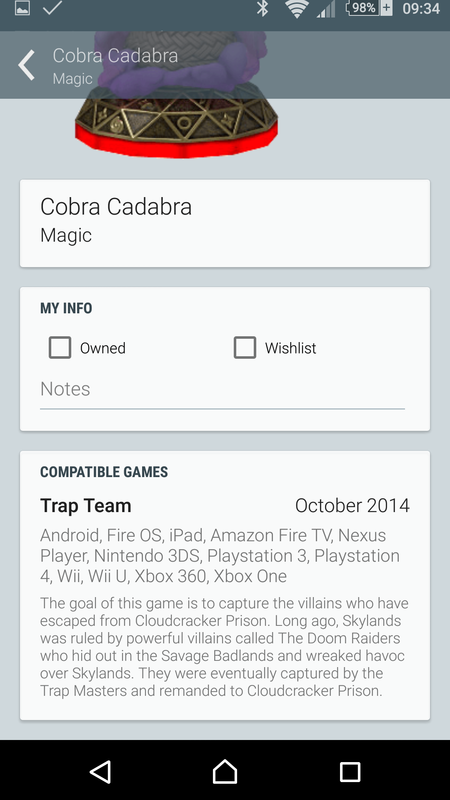 You can not only keep track of your own collections, but you can also discover new games to play in various ways. You can check one of the dynamic lists to see what others are playing/loving, you can search for a specific game or you can search by parameters (f.e. you want to see board games that have coop, minimum of 30 min playtime and 4 players). Are you at the store or a garage sale and something catches your eye? Find out if the game is worth your money & time by looking up all relevant information about it fast. 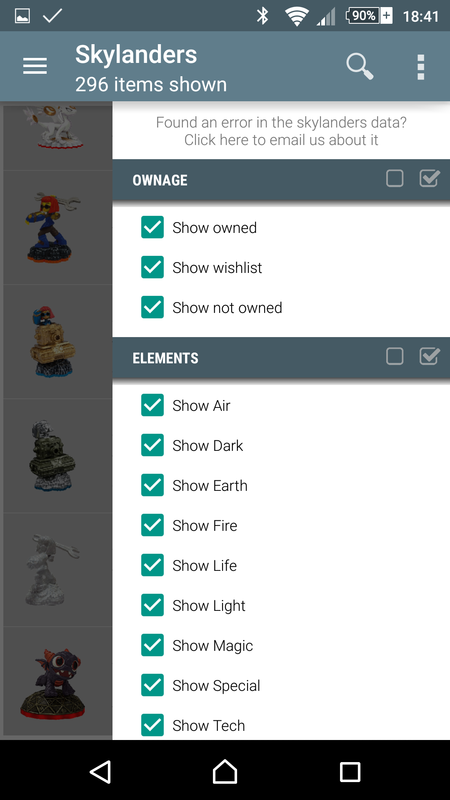 You can also search through your collection with various filters. Lets say you have friends over and you want to play a game. You could let them select a game by allowing them to enter some parameters like number of player, complexity, and many more. They can then easily see details about the game and even view a ‘how-to-play’ or see the manual so that you are up & playing as fast as possible. But we didn’t stop there … Board games are a family thing, so the tool you use should do the same. My Board Game Collection uses cloud storage that allows you to sync you data to all your devices and family members. It doesn’t even matter what platform: Android, iOS, Windows. Phone, tablet, desktop. Doesn’t matter. My Board Game Collection will sync up. More? Yes. My kids don’t speak english (yet :)) and I wanted them to be able to use the app. Therefor we allow you to translate description & comments to any language. The app itself is also translated in multiple languages and more are coming. Download My Board Game Collection today for free! When using the free version of My Board Game Collection you will be shown ads from Google’s network ‘Admob’. These ads will be personalized for you, so you only see relevant things. Developing apps costs a lot of time, and thus a lot of money. Through these ads a small amount of money can be earned by the developer which helps the further development of My Board Game Collection. The best way to improve upon an app is knowing how it it used by its many users. By having this information we can improve upon the features that are popular, and improve unclear features. Gathering this data can be done in a number of ways. We have chosen to do this by gathering anonymous statistics. We have chosen this route for the simplicity and anonymity it gives our users. It would be highly impractical (and kind of creepy) to ask all those users if you can watch over their should while they use the app :). These statistics give us an idea what screens & features are popular and because of this we know where to focus our efforts. My Board Game Collection will download large resolution images from the internet. These images will be stored inside the apps cache on your device. 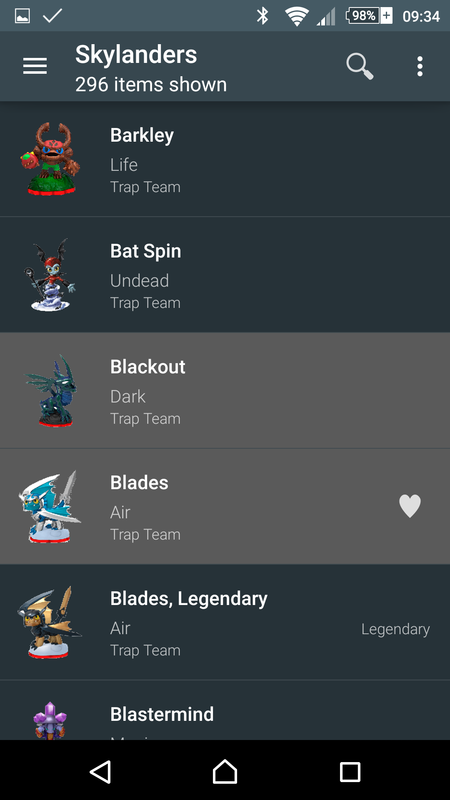 This cache can be cleared, but My Board Game Collection will redownload these images to the cache when you go into a detail screen. Every app is created by a human, and as a result has imperfect code. We try to make all software as bug free as possible, but because of the complexity of creating software and the many number of devices out there this is impossible. The technical data of a crash really helps finding these problems and solving them. This is why we use a system that automatically sends an anonymous crash report so we can find out what made the app crash for you. When using the free version of Json Genie you will be shown ads from Google’s network ‘Admob’. These ads will be personalized for you, so you only see relevant things. Developing apps costs a lot of time, and thus a lot of money. Through these ads a small amount of money can be earned by the developer which helps the further development of Json Genie. When using the free version of My Board Game Collection you will be shown ads from Microsoft’s ad network. These ads will be personalized for you, so you only see relevant things. Developing apps costs a lot of time, and thus a lot of money. Through these ads a small amount of money can be earned by the developer which helps the further development of My Board Game Collection. Gathering this data can be done in a number of ways. We have chosen to do this by gathering anonymous statistics. We have chosen this route for the simplicity and anonymity it gives our users. It would be highly impractical (and kind of creepy) to ask all those users if you can watch over their shoulder while they use the app :). These statistics give us an idea what screens & features are popular and because of this we know where to focus our efforts. When using the free version of My Collections: Dimensions Edition you will be shown ads from Google’s network ‘Admob’. These ads will be personalized for you, so you only see relevant things. Developing apps costs a lot of time, and thus a lot of money. Through these ads a small amount of money can be earned by the developer which helps the further development of My Collections: Dimensions Edition. My Collections: Dimensions Edition will download large resolution images from the internet. These images will be stored inside the apps cache on your device. This cache can be cleared, but My Collections: Dimensions Edition will redownload these images to the cache when you go into a detail screen. Join the My Game Collection Subreddit! 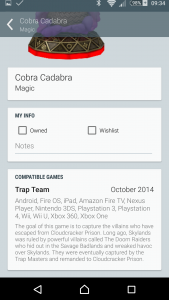 When using the free version of My Game Collection you will be shown ads from Google’s network ‘Admob’. These ads will be personalized for you, so you only see relevant things. Developing apps costs a lot of time, and thus a lot of money. Through these ads a small amount of money can be earned by the developer which helps the further development of MGC. MGC will download large resolution images from the internet. These images will be stored inside the apps cache on your device. This cache can be cleared, but MGC will redownload these images to the cache when you go into a detail screen. 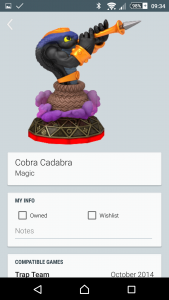 When using the free version of My Disney Infinity Collection you will be shown ads from Google’s network ‘Admob’. These ads will be personalized for you, so you only see relevant things. Developing apps costs a lot of time, and thus a lot of money. Through these ads a small amount of money can be earned by the developer which helps the further development of MDIC. MDIC will download large resolution images from the internet. These images will be stored inside the apps cache on your device. This cache can be cleared, but MDIC will redownload these images to the cache when you go into a detail screen. 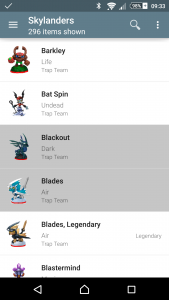 You can view the Skylanders part in light or dark mode, as is with all lists in My Game Collection you can view. 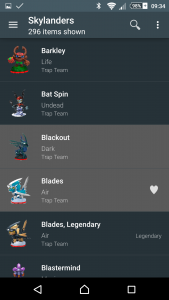 When you don’t own a certain Skylander it will be shown in the list with a grayed out background. 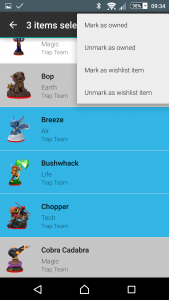 When a Skylander is on you wishlist it will be shown with a heart icon next to it. 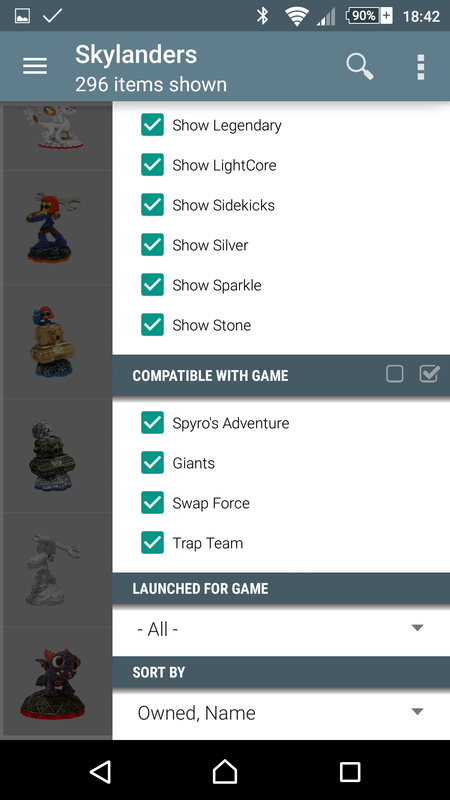 Clicking the search icon allows you to search on the Skylanders name. Long pressing a row or clicking the image starts selection mode. 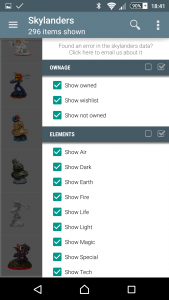 This allows you to batch mark Skylanders as (not) owned or put them on your wishlist. 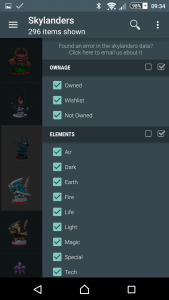 When not in selection mode you can open the filter options by clicking the 3-dot menu or swiping from the right. 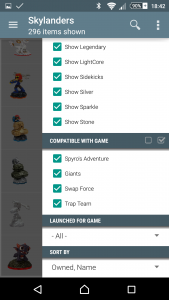 My Game Collection allows you to filter the Skylanders list, search it and sort it by a number of means. Find some more screenshots below.